In addition to my love of cooking and cookbooks, I also am endlessly fascinated by kitchen gadgets. I can’t tell you how many times I’ve designed my dream kitchen in my head. I’m always interested in trying out the latest and greatest cookware. When I was asked if I wanted to take the new Hestan Cue, a tool designed to help me cook like a pro, for a test run I jumped at the chance. Let’s face it, we’ve all had the dreaded kitchen nightmare experience. You decide to try out a new recipe only to have turn into a disaster. Sometimes it because we get distracted and our food gets overcooked. Other times it’s because setting our oven or stovetop to the exact temperature isn’t always possible. What is medium high? And how do you really know if your oven is cooking at 350°? 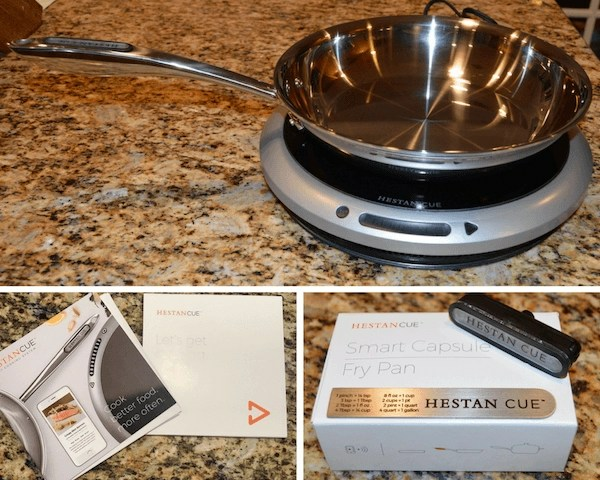 Enter the technologically smart Hestan Cue, Induction Burner and Smart Cookware. The Hestan Cue system is designed to take the guesswork out of cooking. Instead of trying to figure out how to get the perfect sear or knowing when your food is cooked to medium or medium rare, the system does it for you. How does it accomplish this? Through Bluetooth enabled devices combined with your Bluetooth enabled phone or tablet. 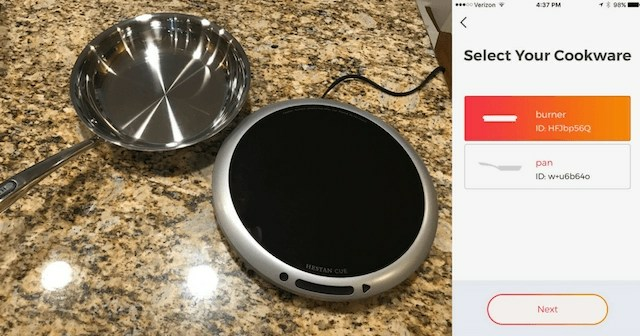 You simply download the Hestan Cue app to your device and then sync it up with their Smart Induction Burner and Fry Pan or Chef’s Pot. 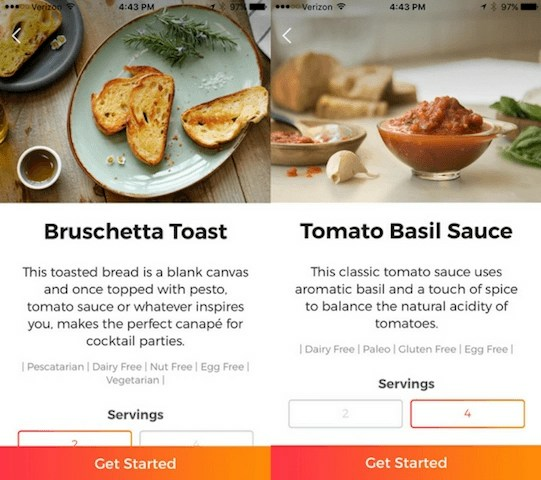 Not only does the app help you become a master chef, but it also offers up a variety of recipe choices. You can choose by cuisine, season, mood, main ingredient, dietary restriction, meal/course, or getting started. After reading through the included booklets and syncing up my Hestan Cue System, I was ready to try out some of the recipes created by Michelin-starred chefs. 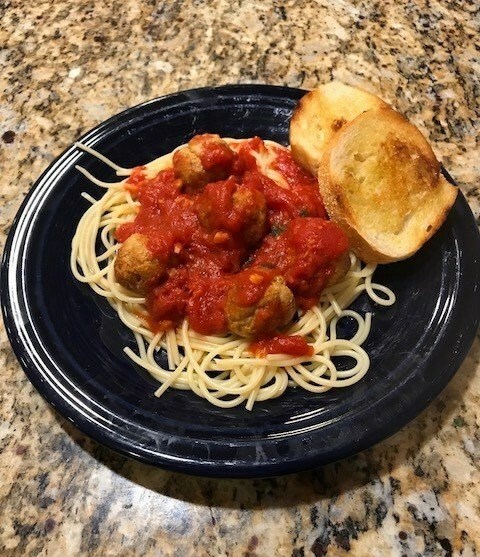 I was in the mood for Italian and decided to make Turkey Meatballs and Spaghetti. To accompany this, I choose the Bruschetta Toast and Tomato Basil Sauce from the app. I was especially excited to make the sauce because I’ve always wanted to make my own from scratch. I choose my serving size and then gathered all my ingredients as listed in the recipe. Next, I clicked Get Started and was taken to a new screen which provided the details for the next step. There was also an instructional video to guide me if I needed it. I have mixed feelings about this feature. It’s great if you are a new cook, but a little distracting if you already know how to say chop garlic. Overall, I do think it can be a benefit, especially if you come to a step that asks you do something you’ve never tried. 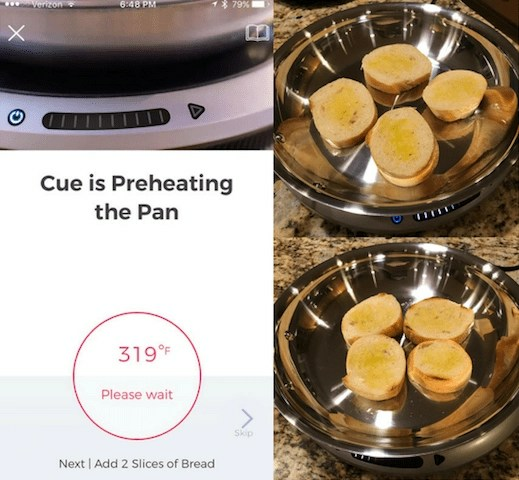 One of my favorite features of the app is how it automatically tells the burner to heat up and adjusts the temperature as you cook. I also really love the built-in timer. It means I don’t have to worry about setting my own timer, which I occasionally forget to do. Having the built-in recipe timer also means whatever I cooking in my Hestan Cue won’t overcook while I preparing the rest of my meal. Best of all, the videos and pictures allow me to see what my recipe should look like as I’m cooking it. I’ve always hated cookbooks without pictures. There are times when I need to see what the final outcome should look like. With the Hestan Cue, I knew exactly what to expect. My Tomato Basil Sauce came out perfectly. It had just the right amount of flavor and spice for my turkey meatballs. The Bruschetta had just the right mix of crisp and chewiness I like in my bread. Both made Italian night a success and so much fun. I can’t wait to give more Hestan Cue recipes a try. Maybe Asian or Fall inspired or perhaps I’ll opt for my favorite meal, Brunch. 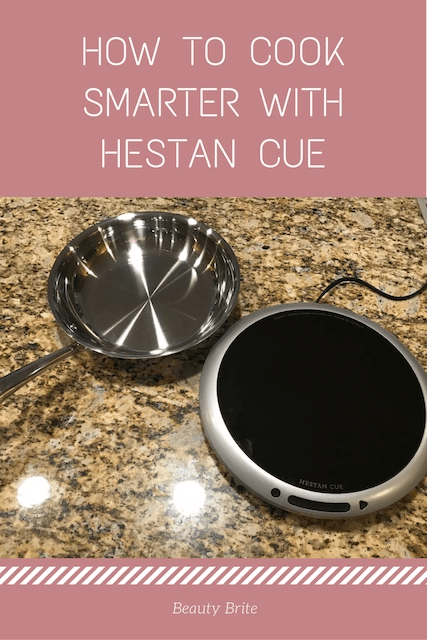 Want to try out the Hestan Cue for yourself? 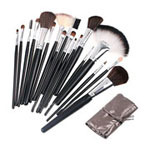 Use code CUEBEAUTY at checkout to receive $50 off your order. What’s your favorite cuisine to cook? How would you use Hestan Cue in your kitchen? This is great!! I’d definitely love to try this! I’ve never heard of it but it’s really neat! What a fabulous tool! I would love to have a stove that did this! At least on one burner. Taking the guess work out would be so wonderful. This is my first time hearing about this and I’m really curious! I think it’s awesome that you’re sharing your experience. I think it’s a cool new gadget to have at home. I love that it comes with recipes as well. It’s not difficult to use at all! 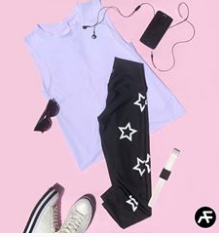 This looks like an amazing item that I must have!! Wowzers that looks awesome. Going to go look up more about it! I’m a little envious! I seriously need the Hestan Cue to help me in the kitchen! This looks like an amazing product for someone like me who can’t cook! This looks really cool I love trying out new kitchen gadgets too so I will have to look into this guy! I’ve never heard of this brand before, but I am all about cookware and gadgets! And anything that helps me out in the kitchen, I’m all in! These sound amazing. This is neat. I can see how this would be great for a senior, in a small apartment. I know I would like it too. Amazing product for home and travel. Have to check this one out and get more info. Glad you shared this! Wow, a pot with bluetooth technology. It should be a no-brainer that was coming, but the advances in technology still often impress me. The Heston Cue looks like it can really be helpful in so many ways. 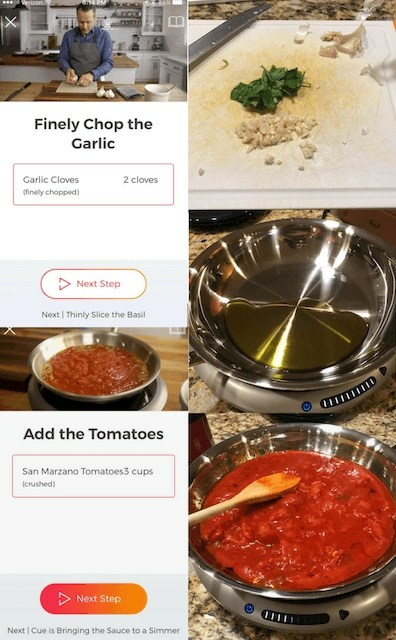 I certainly rarely get recipes perfect so the app would be very helpful for me. I love all the guidance that you are provided with as you are cooking. This is a great way to make sure that the recipe comes out just right. This is so neat! Talk about revolutionizing cooking. I’m definitely putting this on my Christmas list! I never heard of this cookware! Sounds pretty awesome and I would totally love to try it!! Cookware should definitely make things easier when it comes to making dishes. This looks like it does just that. Never tried this one but it sounds like a great tool to have in the kitchen. Will spread the word with my friends who LOVE cooking! What a cool culinary tool. I’m kind of a kitchen gadget junkie so I need to check this out.